Free classified ads online are getting popular these days. Jobs are posted and people can actually also post that they're on the lookout for a job. People sell items and people post the items that they need or want to have. OLX is an online shop of goods and services, and even friendships or relationships right at your fingertips. 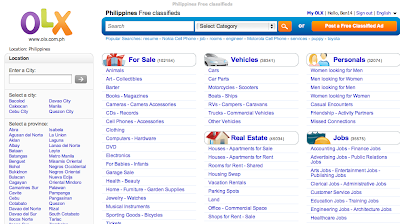 OLX only started in 2006 but the site has a lot to offer to Filipinos - from sections of For Sale items, Vehicles, Real Estate, Classes/ workshops to Jobs, Services, Community and even Personals (for online friendship and dating). One of the things I searched on this site has something to do with what I love best, which is Art. 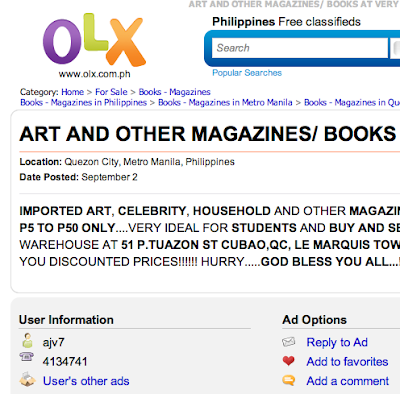 So I checked if there are good finds on art under "books - magazines." True enough, I found one very interesting ad that offers a cheaper rate. Since I collect art magazines and books seriously, I will surely check this out. But I will have to call first since the address is located somewhere in Quezon City, and traveling from Parañaque City would take me about 2 hours. Searching over the many sections of the site, I realized that I can also sell a lot of items just lurking in my cabinet and closet, aside from the books I'm planning to sell. It's also a good way to give space to my things. I can also check out items that are being sold within Makati under For Sale Makati. And if you just be patient to browse as much ads as you can, you can actually sell your items and help someone who is looking for the specific items that you yourself have. By then, you can have an instant client ready to buy your product/s. There are also a lot who are searching for jobs everyday. If you are looking for a job nearby, you may check out Jobs Quezon City, especially if you live within the area, to save both time & money. You'll never know that the things you actually need are here on OLX! Happy browsing!